The start of the year is traditionally a time for reassessment, setting new directions etc. And an area of my hobby where this is quite evident is in relation to hobby podcasts. I listen to these podcasts on the way to work, if I’m out walking or at my painting table. Two have stood out for me as being the best of the genre in regard to my interests – Bad Dice and Heelanhammer. The other main two I listen to are Podhammer and World’s End Radio. Both these last two have signalled at the start of 2011 that they will be moving in a new direction. Podhammer will be shifting a large part of its focus to Warmachine/Hordes while World’s End will be doing that as well and also devoting time to Spartan Games (uncharted Seas, Dystopian Wars & Firestorm Armada) and Wyrd Miniatures (Malifaux). To be honest I’m not surprised with Podhammer. In the past year the show has lack its initial enthusiasm (not surprising after 3+ years) and has lost a number of its regular co-hosts – Matt Cole, Steve Gibb, Dave Palmer – that gave it breadth and variety. They haven’t been helped by the GW release schedule that has seen no new 8th Edition Army Book released up to now. Also the undercurrent of “The Sundering” in the Australian WHFB scene hasn’t made it an easy environment to work with. I was increasingly getting the feeling that they were in a holding exercise until their Adepticon trip in the second quarter. I think Jeff Carroll has done a great job running a single focus podcast for as long as he has and it will be great if he can capture the same enthusiasm for his venture into Warmachine/Hordes. World’s End Radio has always taken a multi-system approach covering 40k and Bloodbowl as well as other GW Specialist Games and boardgames. The show has always been an excellent mix and probably been my favourite “hobby” show. Luke Retalleck does a great job in his handling of different game systems and the show is at its best when he utilises an invited guest to provide informed comment. I can see this show still having enough breadth to keep me coming back – in particular I’m looking forward to Mike Bask(?) and his Malifaux coverage. The good thing with these shows is that you can subscribe through iTunes and have the shows downloaded automatically. I’ll continue to do this and delete those that aren’t of interest until I get a feel for the new direction. In the meantime I’m on the lookout for replacement podcasts and I haven’t found ones of similar quality (content-wise) to Bad Dice/Heelanhammer. I’ve tried Pointhammered and Two Gamer Radio but neither suits my tastes. I will try out The Waaagh Cast for a few episodes to see how that goes. I’d like to acknowledge the efforts of all these people who provide podcasts for the hobby. They devote enormous time into producing these shows for little reward, other than satisfaction for a job well done. February sees the season openers for the 2011 tournament season here in New Zealand. First off the bat is Warclouds in Christchurch. This year this is a Warhammer Doubles event being TO'd by Darren Urquhart (warpmaster on most forums). I hope this is a raging success as I'd love to see the Doubles format become a staple on the tournament calender. The second weekend in February sees Over the Top in Hamilton. Ryan Simister has stepped in late to TO this event. OTT is one of the few (only?) NZ events to allow Special Characters - though I understand only one of each is allowed at the event. Third event (and third weekend in February) is FluffyCon at the Battlecry convention in Auckland. This event is unique in this part of the world. Emphasis is on soft and fluffy lists and getting out those units that are rarely seen on the table. This year's TO is David Stent (fujin) and he's done a great job in getting 30+ players along to what promises to be a fascinating tournament. I know there are a few tickets left so if you can support it then drop into the City Guard forums for details. So that is the February calender. As far a I know March is looking very light. Equinox is on the third weekend in March, also in Auckland. This is being run by Phil Wu (wouster on the forums) and will use the ETC restrictions. Last year it attracted 30+ gamers so hopefully this year there will be similar support. Good luck to all the event organisers. I know the hard work that goes into these tournaments and you deserve to be supported by the community. I'm looking to drop the PWM and use that to buy some more Clan Rats....say 10 for 45 points....then 2 more Stormvermin and 2 Slaves. The list has nothing to really deal with the WoC Chosen (especially with Terror Banner and Warshrine) or VC Grave Guard - Big Magic excepted. Time to go back to the burrows for some tactical scheming. So back from the Chaos Wastes and the rats have their tails between their legs....those that still have their tails!! Tim managed to give me a right smacking - he won by 532 points - taking out all my support units as I tried to stop the steamroller. Notable points were me losing both of my Engineers when the Hellcannon misfired and inflicted a miscast on all magic users; the Chosen getting their 3+ Ward and then +1 T from the Warshrine; the Hell Pit Abomination disappearing to a single Fireball (all 17 hits of it) and the WoC BSB stealing Warp Lightning and then rolling "1" for number of hits both time he cast it. Great fun game that Tim completely dominated. Well done. This morning I've got a game down at the Warlords against Tim's Warriors of Chaos. It will be the first time I've tried Bell Skaven versus the WoC and I'm expecting a tough day in the field. Tim will be toting a Tzeentch Chosen Funbus, big unit of Rage Warriors and at least one other Warrior block, the Warshrine and probably a Hellcannon. I better send out an order to the Slavepits. I think I'll need to replenish my stocks this evening. Okay today is my “Work Experience Day” at Games Workshop Nottingham and Matt Ward and Jeremy Vetock have sat me at a desk and asked me to come up with a list of five things I would change in the 8th Edition rules if I had the chance. 5. Revise the Monsters & Handlers rules – they are a mess significantly increasing the effectiveness of the units that use them, primarily due to wound allocation. Part of the reason why Salamanders, Hydras and Hellcannons are so good. 4. Stop the “Dirty Reform” Manoeuvre – we all know it is possible to reform into a building that you can’t enter normally due to the building rules. You swift reform then move normally into the building legally moving models up to three times their normal move without marching. I’m going to go out on a limb here and say that this method wasn’t considered when the rules were written. It has a huge impact on the “Watchtower” scenario. Simple fix – A unit can’t enter a building in the turn it undertakes a Swift Reform. 3. Limit the use of Power Dice to a maximum of 12 per turn – you can generate more than 12 dice but it is only possible to use 12. At the moment the rule is that you can never have more than 12 in the pool at any one time. 2. Limit the effect of “Big Magic” spells – Rather than remove a model, spells that target every model in the unit (e.g. 13th Spell, Dwellers etc) only do a single wound to a multiwound character. 1. Random Game Length – introduce Random Game Length into all the scenarios. This creates uncertainty in your choices late in the game e.g. do I flee this unit not knowing if there is another turn, the inability to expose characters and units with impunity, should I use or save my item. Personally I think it would greatly improve the game giving another level of uncertainty that you must manage. So what are your thoughts? Like to see those changes in a future update? Not as Cutting Edge as I Thought!!!! GW have released new Weapons Teams over the past few months – Warpfire Thrower and Poisoned Wind Mortar in Island of Blood, Doomflayer and Warpgrinder in the Second Wave. I thought I had had a really good idea for a conversion of that Weapons Team. Take the new Warpgrinder and remove the Warpstone Bit then replace it with a stripped down Assault Cannon from 40k. Assembled all the bits and then started reading my new Skaven Heraldry/Uniform book. About halfway through there is a picture of a Ratling Gun that is almost exactly that. So my “novel” conversion becomes run-of-the-mill. Oh well……still think it looks good (hopefully have pics up next week once it is painted) – and at least there is a use for the new Warpgrinder model. Well yesterday’s post on the “ripple effect” caused a few ripples of its own. On one of the forums I was accused of having a “sook” by one reader who cut and pasted the post. The Dogcon Organiser, Ken Ferris (who is a mate) laid out his thoughts which were that 8th Edition needs such changes to take it from the realms of “Garage” game to “Tournament” game. I think that these types of discussion are healthy. I get to understand the thoughts of others and hopefully, if I explain my points clearly, they understand mine. That said, I’m still very much of the view that by applying a fix for one aspect of the game you don’t like just moves the problem somewhere else. I get images of Bugs Bunny trying to plug leaks in a dyke at risk from floodwaters. Gamers are generally smart people. If one aspect changes – be it rule, scenario or army composition – they adapt…….and the metagame shifts. Limiting Big Magic has a huge effect. As noted yesterday it removes a major threat from combat-based death stars. So people are rewarded for taking combat based armies. Is it really any surprise that the top two armies at DogCon were Warriors of Chaos and Vampire Counts? Good generals cutting the cloth that fits. Good luck to Ken, he tried something different and it had the effect he thought it would – there were less spells cast with Irresistible Force. I’ll still stick to the point that it had other effects too. In the aftermath of Dogcon there seems to be increased acceptance in Australia of modifying the core rules. At the event they used a system that required three “sixes” to get an Irresistible Force on a spell and by all accounts that was widely welcomed. A roll of two “sixes” was still a Loss of Control requiring a roll on the misfire table. On the surface this seems a reasonable change but scratch the surface and I think there is evidence of the ripple effect at work. • Daemons of Chaos Bloodletters with Herald (especially if buffed with Life magic – “Regrowth” or “Flesh to Stone”). An assault on the building is unlikely to dislodge these troops – outcome based on wounds, defender Steadfast – nor is shooting – templates = D6 wounds, -2 to shooting. So how do you prevent the auto-win? You have to start fiddling with other rules be they core rules and/or army composition. Limiting the size of units is only marginal effective as you can only utilise 10 models in a building combat – so to be blunt there is little difference between 20 and 40 models in the unit. Change the scoring in the scenarios? Yes you can do this but that starts to generate even more ripples. Where do you stop? Do you go down the road that the organisers of the UK’s South Coast GT have, where they are playing six games of Battleline? To me this indicative of people not wanting to adapt to the new rules. Scenarios are a part of it. Big Magic is a part of it. Death Stars are a part of it. I think the recent UK Masters showed that when taken as a whole the core rules worked. The event was won by a player with a “balanced” army that was effective in the rules, across all scenarios and against all opponents. Those that tried to be “clever” with their extreme or limited dimension builds weren’t as effective as they hoped. Rather than start fiddling with the rules people should follow his lead and be able to adapt to various situations. I’ll happily predict that the removal of the magic threat if widely adopted in Australia will lead to events being dominated by the combat armies. We’ll then see a backlash and further rules “adjustments”. On Sunday I had a game with my new list – the Skaven Utility Company (for all your telephone, electrical and gas needs) – against Tom’s Daemons. We rolled up Watchtower which is pretty much his best scenario and my worst. Why? Removing 30 Bloodletters with attached Herald from a building is virtually impossible other than by magic given they always have Init 5 and Hatred. I won the rolloff and said he could have the tower. He had nothing to put in so it remained empty. I made one error at this point I should have blocked access to the tower by scouting with Gutter Runners then sacrificing them first turn. I didn’t and he did the dirty reform into the tower on the first turn. The game was excellent from here. I ignored the block in the tower and concentrated on the second block to try and take it out of the game. Did this to a point and also removed Flamers, Fiends and Furies. At one stage I had the three Slave blocks fighting the second Bloodletter block, GUO and Fiend and found that the Bell was excellent in supporting this combat – 18” inspiring presence plus re-roll Leadership tests. The army seems to have a stronger backbone…if less hitty power. I did cheat – well I am Skaven after all! I joined the BSB to the Bell unit after deployment and I also continued casting after failing to dispel a RIP spell with my Grey Seer. Neither was really crucial but lessons learned. In the end we had 5 turns and Tom had his Bloodletters with 10 left in the building. I had left things one turn to late. I think my tactics were sound and thought Tom played very well…it is a hard match up for Skaven. Really fun game and again reinforced my love of scenarios and the inclusion of random game length. Received an email in response to my “Tournament Restrictions” post and thought it worth sharing. I have abridged parts of it but think that it makes some very good points that are worth wider consideration. “I can understand the rationale behind the daemonic gift restrictions, but as a competitive player, I can tell you that not allowing duplication of Master of Sorcery [MoS] makes daemons mono-build. It's likely that you're specifically targeting this, Spell Breaker and Siren Song, but something like Armour of Khorne is fairly harmless. With one Tzeentch Herald with MoS at 2000pts you have to take a big block of Horrors to get anywhere close to suitable magic defence, possibly Standard of Sundering on top of that. With one Tzeentch Herald with MoS at 2400pts you have to take a Greater Daemon, more specifically/likely a level 3/4 Great unclean one. No one is going to take a non-MoS Tzeentch herald. There's absolutely no point now that they no longer generate dice like in 7th. The Daemonic Tzeentch lore is pretty pants when you can only have 2 of the spells at random (and rolling a 1,2 combo makes it basically useless). So at 2k, you take your Tzeentch Herald + Horror block, Khorne Herald + Bloodletter block + support/units to taste (which won't be much since you have to sink lots of points into those Horrors). This would certainly restrict what I could do with the list, to the point where I'd essentially have play more standoff-ish rather than aggressively as you have a massive liability in the horrors. Again, at 2400, it's GUO, Tzeentch Herald + Khorne troops + support, except now you can't really take 2 Khorne heralds because you can't take armour for them, which makes them very fragile. So you likely switch to Daemonettes and Shadow magic. The ability to take 2 MoS gifts allows you to open up more builds. At 2k it allows you to take 2 Bloodletter blocks or 1+daemonettes/plaguebearers at 2400 it allows you to operate the 4 herald build instead of taking a greater daemon. Meanwhile, vampires can still duplicate loremaster all they want. Honestly, I can see why you'd want to restrict loremaster abilities, but this cuts daemons at the knees and in my view allows for one build because you can't cover your bases. Possibly the intent, and something I'd accept, but daemon armies are looking cookie cutter as it is. Also, just as clarification, does the no duplication of 80pt Rares mean you can only have 2 single Fiends, or could you possibly have 1 single Fiend and then another unit of multiple Fiends. Again, if restricted there all daemon players are going 2 single Fiends, 6 Flamers for Rare. I know I must sound a bit whiney, but the army is fairly restricted in optimal choices as is in 8th, this really hurts the variety, if there was any. Right, after my little daemon whine, I think there are other restrictions that need to be put in place. • No more than 3 of the same core choice - eliminates skaven slave/skink skirmisher spam. • I still think storm banner should be BSB only, but that's just me and my general difficulties with Skaven I guess. • I don't really know how powerful high elves are in 8th, but it seems generally accepted that restricting Book of Hoeth and Banner of Sorcery is a good idea. I think it should be an either/or choice. • And the only other thing I can think of is something like ETCs restriction on shooting troops. I have a feeling they've done this because they've eliminated the scenarios, but facing gunlines really isn't fun (which is why we're restricting war machines), the last thing anyone wants to see is those war machines replaced by lots of units of shooting troops (possibly covered by restricting triplication of core units). Also, why 4 war machines/templates rather than 5? With not being able to duplicate Rares over 80pts I would think that the worst of the war machines would be restricted. And by restricting triple specials you eliminate cannon/stone thrower etc spam. • The restriction on no duplicate Daemonic Gifts was aimed at restricting Mastery of Sorcery, Siren Song and Spell Breaker. I do think that there is a case fore restricting the loremaster ability and also to bring Daemons in line with other races re Dispel Scrolls. The other Daemonic Gifts I don’t see as so much as a problem. • Master of Sorcery. I think the choice is still there for Daemon players. You can take a second Tzeentch Herald or not. I certainly think he is stronger with MoS and understand the arguments – however by allowing it aren’t you just elevating that build over the others. • Loremaster. I need to check my VC book. I thought Master of the Dark Arts was the loremaster ability. That was what the VC restriction was aimed at. I’ll amend to correct power. • Points restriction on Rares. It meant you can repeat a unit if it costs under 80 points. So for Daemons yes two single Fiends. Does this move to a restrictive choice? Possibily. The alternative would be to say no double Rare period. Single Fiends are good but if faced with the choice I’m sure there are people who would choose a Fiend unit rather than necessarily choosing two singles. Single Fiends do suffer from clearing out skirmish units etc whereas a unit of 2-3 Fiends works far better. • Limit to no more than three of the same Core Choice. Certainly can live with that. The only problem I’ve actually seen is the Skink spam, the Slave spam while talked about hasn’t really eventuated. The units tend to get bigger than more numerous. • Limits on shooting. Thought about it but didn’t want to introduce further limits were there hasn’t been a problem to date. The three Core restriction would probably sort out most problems. • Storm Banner on BSB only. Typically it is as you are not seeing huge numbers of Plague Monks or Stormvermin (the only units that can take Magic Banners) anyway. I don’t think you want to restrict those units further by taking options away from them. • Warmachines. The outlier is Orcs & Goblins. I think the restrictions will be informed by the new book. • High Elves. Yep agree – only one of Book of Hoeth and Banner of Sorcery. So what do other people think about these comments and responses? Now that 8th edition has been out for six months I think that people are starting to get a handle on what is strong in various army builds. Personally I think that the combination of core rules, scenarios and mysterious terrain has flattened out a lot of the differences in strength between the various books – certainly far more than 7th Ed ever did. Australasia is one of the spiritual homes of Composition and there was a rush there to introduce list restrictions as soon as 8th arrived off the press. Most of the systems I saw were either rooted strongly in 7th Ed or read like “Crimes Versus the TO”. In particular, there was a drive to introduce composition rather than use the full suite of rules or all the scenarios. With the benefit of six months play I think that any discussions on list restrictions are far more informed now than they were at the time. So pretty minimal (and hopefully not "Crimes Against Pete"). I’m sure you can still come up with a strong (perhaps even abusive) list. However I think that it covers most of the bases without getting too prescriptive. Eighteen months ago Games Workshop used to support the local tournament scene through their Premier Events programme. This system was brought into replace their discontinued Grand Tournament events as “running tournaments is not our core business”. GW were probably right in doing this because in Australasia, at least, their running of Grand Tournaments was becoming more and more problematic – the Auckland 2007 Grand Tournament being a particular low point. Premier Events was a very generous programme. If you were an event that attracted more participants than an agreed threshold you were showered with GW prize support. My 2009 Fields of Blood Grand Tournament had $2000 worth of vouchers from the company and 30 people walked away with at least a $50 voucher. I’m going to hazard a guess that each voucher was matched with additional purchases of at least the same amount. Unfortunately reality bites. The GFC and the state of the pound vs. local currency spelt the death knell of the Premier Events programme. I can’t say I blame GW too much. Rumour has it that the system was royally abused in Australia and more and more sophisticated local buyers were bypassing local GW stores and going to UK-based internet retailers such as Wayland Games and Maelstrom Games. If you aren’t going to buy from the local GW you can’t really expect the local GW to support you. Last year they introduced their “new” support package – which was actually their old package from circa-2002. Tournament organisers could purchase product from GW at a 45% discount to retail (or roughly the same price as Maelstrom) and also purchase some pretty funky trophies (Chainsword – 40k and Warhammer – Fantasy). For 2010 Fields of Blood Grand Tournament I passed on the opportunity, mainly because I already spent $1000 on plaques. I found out today that GW have now canned that support package. Now they will provide advertising in White Dwarf but that is it. And that got me thinking. I wonder why? Is this a cost cutting measure by the company? Or does this signal something else? Games Workshop have resurrected Games Day for Australia in 2011. I wonder if we are going to see the rebirth of Australian Grand Tournaments. One talking point that is raised from time to time is Games Workshops release schedule since the introduction of 8th Edition. 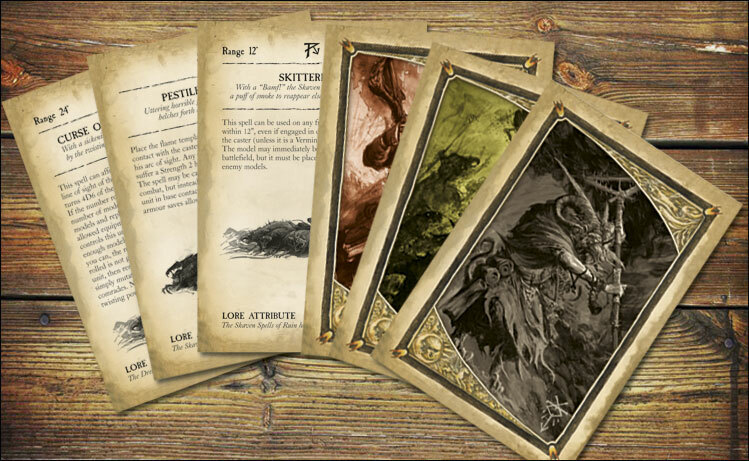 In addition there have been the Battle Magic cards and cards for Beastmen, Daemons, High Elves and Skaven. So as I said pretty spartan! The release of past editions has usually been quickly followed by the release of a new army book. With 8th we won’t see our first 8th Ed Warhammer Armies book until Orcs and Goblins are released in March. This is a gap of a year since the last book, Beastmen, and eight months since the new rules. There has been considerable unease that this gap has been too long. The argument goes that GW missed a trick by not following up the 8th’s release with a book in the first 1-2 months. I’m not so sure that this is correct – and from a gaming (rather than hobby) point of view I think I prefer the approach that GW has taken. Why? Well they have used the period to do two things that a “gamer” should appreciate. Firstly, they have filled gaps in the existing model range. That has to be a good thing, doesn’t it? One of the complaints previously levelled at GW was they released books with choices you couldn’t buy. It looks to me like they’ve listened. Secondly, they have addressed the rules issues that accompany the release of any new ruleset – both for the core rules and for the individual army books. Three sets of FAQ have been released for the BRB and I think GW have done a good job in answering most of the inconsistencies identified when you have real-life play testing. Similarly each of the army books have had multiple FAQs released as the conflicts arise as you try to marry a new ruleset with earlier books. Again it looks to me like GW have listened to what had been common complaints of irregular FAQs. So at the risk of sounding like a GW fanboi I think GW has done a good job of creating a strong base for the release of new books. Most conflicts have been identified and addressed for the existing releases. Similarly people have got their heads around the new ruleset and are moving away from mechanisms and interpretations and starting to focus on tactics. The Attraction of 8th Edition - A Triumph of Variables Over Efficiency? I believe in market efficiency. What this means is that there is always a most efficient choice for a given set of circumstances. In gaming this means that for set points value, set scenarios and set terrain densities you will have a most efficient list selection. This is then overlaid by the potential opponents you may face, both human and army choice. It’s not an easy calculation given the nature of the variables. In late 7th Edition I felt things got a bit easier as events moved to a standard size (typically 2250 points around here), the Pitched Battle Scenario and a typical tournament table with two hills and two woods. On top of this four books emerged as superior to the rest of the field – Daemons of Chaos, Dark Elves, Vampire Counts and Lizardmen. In the UK which had a large number of no comp events, these four armies dominated tournament numbers and more importantly dominated the top tables. Very quickly army selection became very standardised as the most efficient army for the given variables was distilled from the army book. As each new book was released this might require some recalibration but the “market” quickly adjusted. What did this mean? Little variation and importantly a drift to the stronger books. Places like Australasia were a little more insulated as they had another variable – the use of Composition. However if the system stayed static too long then the variability decreased. Well one of the reasons I have enjoyed 8th Ed is that everything was thrown up in the air. Suddenly a new variable was introduced – new rules. This meant that everything you knew previously may have been a lie! Looking at Skaven for instance, previously fantastic choices like Censer Bearers and Doomwheels weren’t so great anymore. However it wasn’t just the core new rules though these were radical – Steadfast, Winds of Magic, new Battle Magic Lores etc – it was also the ancillaries – new Terrain rules and Scenarios. Some people don’t like all the variables…especially the scenarios which can really hurt those that like certainty. However I see it differently. To me they are opportunities to test yourself. Want an army with only four units? Well you better have a plan to deal with poor rolls in Dawn Attack and Meeting Engagement! You’ll commonly hear “I got shafted by the scenario” but really what they should be saying is “I ignored possible outcomes when I built my list and then I lucked out”. And this to me is the beauty of 8th. It creates more viable armies because there are more variables. Over time market efficiency may win out but by having more variables I think this is likely to be a more tortuous process and in the end tournaments become less about list building and being able to navigate a known set of variables and more about your ability to think on your feet and adapt to changing circumstances. I think that this was borne out just a little at the UK Masters where when you got together a group of strong players, a balanced rather than gimmicky army won out. I can’t wait until March when we get Orcs & Goblins and things change again. You can have too much of a good thing!!! I was looking at list construction last night for the Skaven and had got excited about the ability to take Level 1 Wizards for the bargain basement price of 65 points. Skaven Engineers can default to the Warp Lightning spell which inflicts D6 Strength 5 hits on a unit if successfully cast. These guys can fulfil a role missing in the Skaven list i.e. a semi-reliable non-template based ranged attack. The spell has a casting level of 6, meaning your Level One needs to roll at least 5 to get it off successfully. To me this means that I need to roll two dice to have a reasonable expectation that the spell would be cast. I ran a list on the weekend that had three of these beasties plus my Grey Seer. At the time it felt “difficult” and giving it some thought I’ve worked out why. When you roll for Winds of Magic you’re expected outcome is 7 Power Dice. The list I had on the weekend had 4 channels and a condenser (excessive, I think so) and this should generate an extra dice giving you 8 total. If you look to fully utilise your three engineers then you would need to allocate 6 power dice. This should result in the spell being successfully cast 2.5 times. Obviously your opponent can then attempt to dispel. However, more importantly it leaves your Grey Seer with just two dice (on average) to utilise his spells. Given the higher casting values of the more “useful” spells this really put your phase under pressure. And this is just averages….you will deviate from the average 8 PD most turns. Dropping one of the Engineers changes the dynamic. You lose one of the channelling attempts but will still on average have 7.83 PD. By using the same assignment of two dice for each Warp Lightning you end up with your Seer having 3.83 dice. Far more respectable. Obviously just because you have three Engineers you don’t have to have them all throw Warp Lightning every turn. You may like the redundancy that having the option gives you and the ability to fully utilise those high PD turns. However I think there is a strong case to say that your Seer can better utilise those dice – especially with his 4+ to cast. Also if you really want a third Warp Lightning you can have the Seer generate his spells first so he gets to choose it before the Engineers opt to default to it. So spam can potentially look really attractive but once you scratch the surface there is always a cost. Engineers do have other functions in addition to their electrical skills – and there are few models of better value than a 15 point Engineer. However you must always keep in mind your main game plan and the Skaven spell deck is best utilised by a Grey Seer backed up by a cache of power dice. Things aren’t always as they first seem. My first GW game was 40k and it's been awhile since I ran the models around. I started with Black Templar, the Orks and Nids but very quickly gravitated to Chaos Space Marines. I really loved the Deathguard and Emperor's Children and they became my two armies of choice. Around here, and Australia, I had a bit of success with the armies through 3rd and 4th Edition. However, by the time 5th Ed turned up I had moved onto Fantasy. So really it's been 4-5 years since I played seriously. Over the weekend I was looking at the model cabinet and thought I'd like to get the Deathguard out again. So here is my "new" list updated for items rolling off the painting table. It ticks a lot of my Magic Defense boxes while also giving mre the chance to try new things out. I've got 80 points to spend and I'm tossing around a few ideas. The easiest would be another Lvl 1 Engineer but that starts to put pressure on my PD. I'll need to think on it a bit. So there you go. I've got Dwarfs on Thursday night (Hi Tane). I'll let you know how it goes. So my opponent pulled the old switcheroo on me and turned up with Ogres. Really interesting to play against - very difficult for Skaven, I think. My hoped for magic dominance never eventuated and we battled to a tight draw. The Ogres present some real problems for the rats....given me a bit to think about! I've got a game against Lizards today. This will have the "Certainty" Slaan in it without a doubt. I'm looking to try out a new list that drops a few of the staples I've used over the past year and looks to add some ranged firepower. So a bigger Core % than I have been running and a much stronger Magic Defense - I expect to see a lot of Death over the coming months. I'll let you know how I went this evening. A number of the people that have given up playing 8th Edition have cited the fact that the game has been dumbed down in that there are no points awarded for having enemy troops fleeing on the board at the end of the game. Obviously this is a change from 7th edition and is an example of how the game has been bastardised. To the detractors this means that you have the ability to flee all charges in the last turn with impunity as no victory points are given up. This is potentially true for the player who went first and is charged at the bottom of the last turn by the player who went second. They are not required to make an attempt to rally their troops and as long as they stay on the board they are okay. For those that flee at the top of the last turn (i.e. the player who when second), they do have to make a rally attempt and if they fail would flee a second time. In their case this means a failure to rally will result in an average combined flee move of 14” for foot (16” for Skaven, 10” for Dwarfs) with the potential to go 24” (26” for Skaven, 22” for Dwarfs). That is a fair chunk of real estate. For those troops with the Swiftstride rule it is even more dangerous. On average a failed rally test will result in a combined flee move of 18.2” with the same potential 24” range. So fleeing is not without risk. This risk can be greatly amplified if the non-fleeing player has fast elements in his list that can make a secondary charge once the “with impunity” unit has decided to flee. Remember this secondary unit doesn’t need to complete the charge; it just has to be within its maximum charge range of the fleeing unit. Very cheap units are ideal for this e.g. Harpies, Furies, Eagles, single Fiends, cheap characters on fliers. A lot of people have cottoned on to this recently and you are seeing a change in list design to accommodate these elements. For some however the requirement to change is just too much! For those that look back on 7th with rose tinted glases, harps strumming in the background, strains of “Kumbaya” ringing out around the campfire – we used to get a similar situation occurring then – just that the boot was on the other foot. Whoever went second would attempt to engage in the last turn points’ scavenge by picking off small vulnerable units knowing that they would face no return fire. Anyone made to panic would immediately yield full points as the owning player had no opportunity to rally their troops. Was this anymore “realistic”? The only way to really address this problem is to take a leaf out of 40k’s book and introduce variable game length. If you don’t know with certainty when the game is going to end then “cynical” fleeing is far less attractive. But I can bet the naysayers wouldn’t like that either. Again it means adapting…..and learning a skill other than estimating the difference between 11.9” and 12.1”. The latest rulebook FAQ from GW is really bad for Skaven players. The re-definition of “unmodified” to take it to base Leadership – not that I disagree – is going to result in a lot of very nervous rats. Now Inspiring Presence, Standard of Discipline and Strength in Numbers are all ineffective when faced with tests that use “unmodified” Leadership. The most obvious danger is the Lore of Death. Most Skaven characters are starting with a Leadership disadvantage of 1-2 points versus the common Death Mages. With the default spell in the lore being Spirit Leech, even secondary mages are now a real threat. With an attribute that generates new dice for each wound caused and a spell range that has three potential snipe spells……well, it’s not a good time to be a rat!. The lowly engineer has Leadership of 5 so his deficit is likely to be 3-4 points on each test. Let’s hope the breeders in the Skyre pits are working overtime as I can see Warlock Engineers typically lasting one to two turns (perhaps we’ll have less whining about them now especially given the number of armies with access to Death Magic). So how are we Skaven going to combat this? Well your key characters – Warlord, Seer and/or BSB – will need a good ward save. The Talisman of Preservation and the Armour of Destiny will be rolling out of Skavenblight factories. This means that your BSB won’t be able to tote a magic banner…..however any banner is of very little use to you when you are dead! An engineer with the Obsidian Amulet for 45 points is also a good buy. The MR2 that comes with this increases your 4+ Ward characters to a 2+ Wd Save which is going to be the best you get. However expect him to be targeted pretty early on….Ld 5 and a 5+ Wd is very little protection. One other item that might be worth investigating is the Feedback Scroll. The Cold War was fought (or not fought) on the basis of Mutually Assured Destruction and Skaven generals may have to engage in a piece of Missile Crisis détente! I suspect a lot of ETC teams will be revisiting their army selection in light of this FAQ ruling. It goes without saying that you can bet your bottom warpstone token that if you are playing Skaven at the event you’ll only ever be matched against Death Magic. The sky(re) is indeed falling!!!!! Skaven Magic Cards - Get Them Quick! This weekend sees the release of Skaven Magic Cards from Games Workshop. In the set you get the 6 Lore of Ruin cards, the 6 Lore of Plague cards and the Curse of the Horned Rat (the Dreaded 13th Spell) card. My understanding is that these sets have already sold out at GWUK online so if you are after a set I would get in quick. I certainly recommend getting them as they make the Magic Phase far easier for you and your opponent. Firstly, you can put them on your side as an aide to what spells you have and secondly, if your opponent asks you can hand him the card and he can read it himself. This absolves you of all responsibility when your Skaven magic destroys his army! Thanks to the wonders of Grotsnot on Warhammer.org.uk's FAQ Checker, when I got up this morning I was alerted to updated FAQs. These include the Rulebook (v1.3)and the Skaven (v1.4). The one of most interest (concern, shock, horror) to Skaven is that Strength in Numbers (SiN) no longer counts for unmodified Leadership. An emergency meeting of the Council of Thirteen is currently underway to alert all Skaven characters to the dangers of Death Magic once again. I have no doubt Clan Eshin assassins are en route to Nottingham to deal with those responsible. Quite obviously Mr. Vetock has been seduced by the Greenskins and taken his eye off the Skaven ball. It is unlikely that he will make further such mistakes! * Monsters and Handlers where some of the rules are cleared up - pretty much mimicking how I have seen the majority of events rule it. The one that will cause most angst is the clarification that breaking troops flee directly away from the centre of the unit it is fleeing from. I know most of us have been playing it as perpendicular. I also intend picking up sets of the Skaven cards, the Heraldry book and Ikit Claw from my local GW. Looking at the marquee releases, the Hell Pit Abomination and the Plagueclaw Catapult/WLC, I'm not sure the new models are as good as my current conversions so I'll be sticking with them for the meantime. Today I got a parcel from James Milner in the UK which has six of the metal Skaven Assassins in it. This will let me fill out my Gutter Runner units totally with assassins. Once all this is painted I'm looking to take army wide pictures. Over the past week I've painted up a new Seer, a Screaming Bell and six weapons teams. I do have 120 clan rats to paint but honestly can't face them at the moment! Over the last week I've managed two games against my sons, Tom and Jack. Both made the NZ Masters in 2010 so they are always tough games. We decided that we would play 2400 points for the next few months. First up was Tom. he is still using Daemons of Chaos but has changed his list to include a GUO and two big (30) Bloodletter blocks. These are backed up by Flamers, 2 single Fiends, a block of 10 Horrors and three Heralds (2 Khorne, one Tzeentch Lvl 2 toting Fire). This was a strange game. After my Turn 1, Tom was calling me a "Hobby Killer" and threatening to "Rage Quit" and start playing Warmachine. My Skaven had one of those turns where everything went right. Both Bloodletter blocks were depleted and the Flamers were now furry rats. Unfortunately (for me) that was as good as it got. From that point onwards Tom completely outplayed me and only by fortuitously taking down the GUO in the last turn did I manage to make the score respectable. Before that it was looking like 20-0 to Tom. This is becoming a bit of a trademark of Tom's. At the Masters he lost all his magic defense Turn 1 yet inflicted a heavy loss on the eventual winner. I saw a similar fightback in his recent game vs. Harry Dixon (who won last year's ETC singles event). Certainly I know i don't have to travel far to get a tough game. The second game was against Jack's Dark Elves. It was the first game since the new Skaven book that I have played without a Plague Furnace. We were playing Watch Tower and though I "won" the right to occupy the tower, I chose not to. Throughout the game I was always on the backfoot. Both of us had misbehaving dice - the highlight from my point of view was a Slave block killing 7 Witch Elves in combat. I was lucky in that the game continued to Turn 6 and at that stage I was able to transform a depleted block of spearmen occupying the tower into some cuddly rats. Although there were "only" 15 in the tower I rolled 6-6-5-6 for my conversion roll. Prior to that Jack had killed my HPA who came back to life with a single wound. A fireball ensured there would be no third coming. The dice we both rolled ensured a far chunk of incompetence on the side of both armies. Nice way to start the year. I'm going to continue to experiment with my list. I've just finished painting a bell. Happy New Year to you all. I hope 2011 brings all you hope, particularly if you are a follower of the great Horned One! For me 2011 is going to be a little bit different. My focus is going to be more on the hobby side of things rather than competitive gaming. I decided this a couple of months ago and with the passage of time it still feels the right decision. What brought me to this juncture? Well it is pretty much the continual bitching/backbiting etc that has plagued the Australasian scene over the past 12 months. In NZ, there has always been areas of the country that have bitched about comp - and it's always other people's armies, strangely enough. Some of the biggest proponent feel it's fine for them to tell others what they should have in their armies and then turn up with armies focused at the top end of the power scale. I had hoped that the introduction of hard caps might help end some of the inconsistencies but it doesn't seem that way. In Australia there has been a "Sundering" where the "top players" have decamped and left to play Warmachine. I think the most charitable thing that can be said is that they adopted a policy of scorched earth on their exit. Now I can understand that a new edition might not be for them - and 8th DOES play differently from 7th - but it seems that a number of people (the UKers have labelled them Rage quitters) did everything they could to denigegrate the game those that continued with Fantasy wanted to play. I have no doubt that they will be back at some stage to "save" the tournament scene by delivering some bastardised form of v7.5. No thanks! So where does that leave my hobby? Well pretty much where I'm happy for it to be. Over the past few years I have built up/bought a series of armies that very rarely see the light of day. I'm looking to get more use out of these armies. One area of the hobby that has always interested me and one where I have had little direct exposure is to the Campaign Weekends that they have in the UK. I would love to run some of these here in New Zealand. The masters of these events are the Tempus Fugitives and I've been talking to them to see whether I can get some help/guidance in putting these in place. The type of event I'm looking at is a two day campaign where the onus is less on competitive gaming and more about the narrative. I can see this working for both Fantasy and 40k. Typically it will involve 8-16 gamers working in 2-4 teams/factions to achieve a campaign objective. As the emphasis is less on the result and more on the story, hopefully it will give gamers an incentive/opportunity to build/try that unit that never sees the light of day at a tournament. Anyway that's my aim for 2011. I hope you all have a fantastic year.